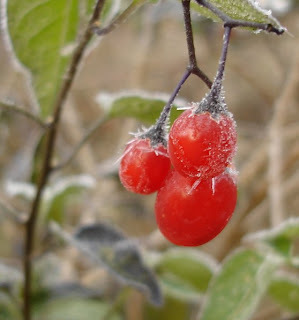 We had our first frost yesterday morning, which made for some pretty pictures. On Sunday we took the dog down to the Sandbanks Provincial Park for a walk along the Cedar Sands Trail. He didn't like the stairs much, but got the hang of them on the way back. This was a bit of a worry, as he doesn't like the stairs at home either, and so far hasn't been upstairs or down to the basement, which suits us fine. We were worried that his new confidence with stairs at Sandbanks would translate into stair use at home, but so far that hasn't happened. In the evening we took the kids into Picton to see Underdog at the Regent Theatre. This turned out to be an unexpected treat. Not the movie, which was as formulaic as I thought it would be (but bearable), but the cinematic experience itself. To start with we were confused by the fact that the box office was shut, so we asked another parent and she explained that the family movie on the last Sunday of the month was sponsored by a local funeral home and was always free. I'm not quite sure what the funeral home hopes to gain by this, but who cares, what a fantastic idea! The concession stand was open, so the theatre was making some money there. So we settled down to watch the film and I was expecting to at least see the name of the funeral home in one of the adverts, but to my amazement there were no adverts at all, nor any trailers. We just sat and watched the movie. It was like stepping back in time. OK, that meant no surround-sound but that's a fairly small price to pay for a really refreshing trip to the pictures. Beautiful styling add elegance to any kitchen decor - you'll be proud to show your Maytag to your friends. I'm just glad they didn't go for the Fresh Avocado or Coffee 'fashionable standard colors' for the front panel, or that sentence would definitely be untrue. The dishwasher is a portable model (WC300, for you dishwasher spotters - I know you're out there), which means you have to wheel it to the sink every time you want to use it - not desperately convenient. The brochure does give the water usage for the washes, which is useful to have. The 'low energy regular' wash we used tonight takes 32 litres of water (7 imperial gallons). I think that is probably similar to what we'd use in three lots of washing-up at the sink during the day, but obviously a new dishwasher would probably use less water (and less electricity too). 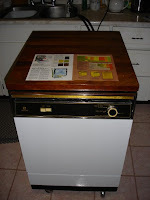 This one cost $780 and the equivalent Maytag washer today costs $499 (US), which is probably about a quarter of the price in real terms. A new dishwasher will have to wait for a new kitchen, which will be a 2008 project - but I probably won't be going for a portable one! 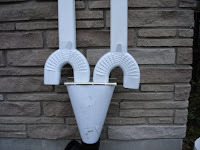 The guttering guys came back on Tuesday evening and connected the eavestroughs to the cistern. There are diverters on the end of them which will switch the water away from the cistern when/if it gets full. One of today's jobs is to get some piping so that that spare water is deposited a bit further away from the house than it would be with the current arrangement. Over the last 24 hours we've had 16mm of rain and that has given us over 30 inches of water in the cistern. 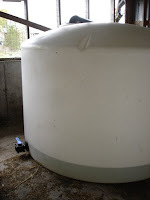 The tanks up in the barn are full, too, and the wells are steadily filling up, so now we've decided that we are no longer suffering from a shortage of water. We celebrated by loading our breakfast dishes into the dishwasher for the first time since we've been here. It looks like it is about 20 years old, mind you, so whether it will work is another matter entirely! 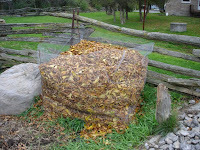 The job of the week has been raking up leaves and filling the leaf-mould-generating contraption that I constructed on Sunday. I've never had enough of a garden to merit building one before and somehow all those bin bags I've filled with leaves over the years have never generated any leaf-mould. Although that's probably because I forget about them from one year to the next and, being disguised as rubbish, they get accidentally thrown out. The large white boulder to the left of the leaf mould maker is, I think, a glacial erratic. It's a handy place to put a cup of tea whilst gardening. While I was collecting the leaves up from under the ash in the front garden, our neighbour, Matthew, arrived to ask where we wanted the manure. 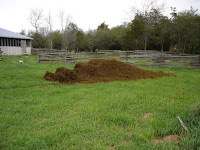 He brought his muck spreader round and deposited a handsome heap of last-year's muck in the barnyard. 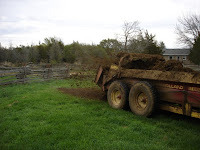 We offered to pay him (as they would otherwise have used the manure on some of their 500 acres (! )), but he said he was just happy to have neighbours who didn't mind the cows. What a very nice man. I had to leave my peppermint essence behind when we moved, but was fairly confident that Bulk Barn would carry it. Bulk Barn is my favourite Canadian store. The first one I noticed was in the Belleville mall, but as its storefront display was entirely made up of pick'n'mix-style bins of sweets, I didn't go inside for ages. When I did, I discovered aisles of loose goods like nuts, dried fruit, grains, pastas, flours and spices. It's like a cross between a health-food shop and Woolworths (with a correspondingly varied clientele). Wholewheat pasta and cous-cous are hard to find in the supermarkets (at least in decent sized packages), so Bulk Barn is great for that kind of thing. I thought they were letting me down today though, as there was vanilla essence, almond extract and even brandy essence (what? ), but no peppermint. Then at the till I found a little display of various oils, including both spearmint and peppermint, so I used peppermint oil instead of essence. I love you, Bulk Barn. *Now I come to think of it, the phrase 'Ogre's eyeballs' appears in an episode in Diana Wynne Jones's The Ogre Downstairs, so that isn't particularly original. It's a brilliant book - and I think the only children's book I've come across where a (very) passing knowledge of Latin and Greek actually adds to the enjoyment of the story. Most of the guttering went up yesterday: just waiting for the last downpipes and the diverter that will stop the cistern overflowing (although that seems like a distant possibility at the moment!). We've had 9.2mm of rain so far today, so the water collected from barn roof has been replenishing the cistern in the house, which is up to 8 inches of water again. Mike fixed the leaky loo today too. The Toyota garage fitted a new tyre to the car yesterday and Mike took a taxi into Belleville this morning to pick it up, so we're mobile again. The nature columnist in the local papers was explaining this week that the Fall colours have been disappointing this year due to the dry and hot conditions during September. 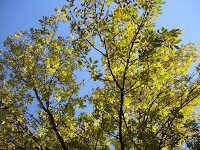 The big ash tree in our front garden (dubbed 'Giganto' by the kids) turned yellow very suddenly just this week, but many of the trees lost their leaves early because of the drought conditions. The maples have been pretty magnificent though, so if this is a disappointing year, I can imagine that a good one will be breathtaking. Yesterday was always going to be a bit hectic: work at Deseronto, picking up child #1 from karate, taking both kids to the inaugural meeting of the Consecon cub group, taking Mike to a meeting on renewable energy in Bloomfield, picking up the kids, picking up Mike. All went more-or-less according to plan, even with time for a meal and a cup of tea in between ferrying jobs, until the last journey of the day. A couple of kilometres out from Bloomfield we got a puncture in one of the car tires. 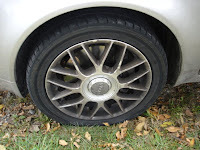 Turns out that this Audi has a cover over the wheel nuts that you need a special tool to remove. And we didn't have the tool. So we phoned the CAA at 9.45pm. The guy got to us at 11.00pm and he couldn't take the cover off either, so he towed the car back to our house and we finally got home just after midnight. I was somewhat surprised that the car didn't turn into a pumpkin at that point. This morning we spoke to the Toyota dealership that sold us the car and they're going to get it off for us, once the CAA take it over to Belleville. In the meantime, work is continuing on the roof, with the fascia boards going up yesterday. Mike also worked out why our water situation had deteriorated so much over the last week - there's a leaky seal in the bathroom toilet, and Mike reckons that it had been consuming about 17 litres of water an hour. So something else to fix, but at least there's a stopcock next to the toilet which means that its water supply can easily be turned off and the cistern just re-filled as necessary. Kilometrestones just doesn't sound the same, does it? Well, anyway, two big milestones today. First of all, we finally ran out of water in the house - both wells and the cistern were effectively dry. So Mike went off to get a 12-volt pump to attach to the plumbing he's set up to the big tanks in the barns (and the tractor). Then he was able to pump the couple of hundred gallons down the hill and into the cistern this afternoon. There is some rain forecast for the rest of the week, but if it doesn't appear then we'll have to buy a tankload of water from a water firm. 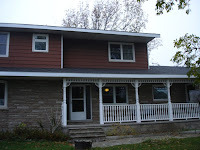 The other big event, a slightly more positive one, was the completion of our new roof. It looks very smart and includes a sunlight tunnel which connects the landing (which has no windows) to the sky through a hole in the ceiling and the roof. The landing is now a lot brighter, especially when all the upstairs doors are shut. The guys who worked on the roof did a really good job and worked incredibly long hours. They had to pack up early on Saturday because the wind became dangerously strong, but otherwise they've been starting at 8am and finishing when it gets dark. They all wander around quite happily on the roof - no scaffolding or obvious safety measures at all. The next job is for the other team of this firm to turn up and fix the new guttering to the house. Gwen the curtain (draperies) lady came around this afternoon and we chose more fabrics. I feel very decadent, having an interior designer, but I'm hopeless at making curtains and blinds (shades) and haven't found anything half-decent of the ready-made variety. She seems fairly snowed under with work, so I'm not sure when any of the window coverings will actually get made, but at least we're making some progress. Yesterday I went to a meeting of the Prince Edward Historical Society, which was very interesting. They look after the archives of the County, in conjunction with the library service (a fairly recent union). There was a talk by a speaker from the Archives of Ontario, who seemed to have trouble working his PowerPoint presentation, which was a bit cringe-making. He also claimed that all their copying services were on a cost-recovery basis only, which seems an outrageous assertion given that their digital images cost $20 each, even if the image already exists! Anyway, I joined the society, so might get more involved with the local archives through that route too, eventually. I knew we wouldn't be able to resist. 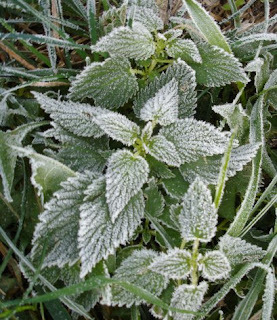 And it did go down to five degrees centigrade last night, so we didn't feel too bad, lighting it. It's been pretty chilly today, too, so we relit it this morning and it's keeping the living room cosy: 21 degrees in there compared to only 18 in the study. Mmm, might have to move into there with the laptop soon. Today work is due to start on replacing our roof with new asphalt shingles, so I thought I'd better do a 'before' picture. I've also had a particular request for a picture of the front of the house, so here it is (well, about half of it, anyway). So far the only sign of activity is the arrival of a big trailer to take away the old shingles, but apparently they'll work through the weekend, so by Monday we should have a water-tight roof that'll last for 30 years. 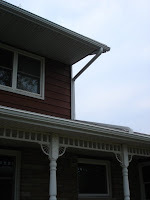 The guttering will have to be removed, which means that our water situation will temporarily get even worse, until the next gang of men come to put the new gutters on. Those will be bigger than the existing eavestroughs, and less leaky, so in the longer term we'll get more water through into the cistern. The mornings are becoming very autumnal now - stout shoes are required to avoid having soaking wet feet from the dew. 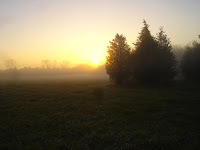 Twice now there's been a coyote lurking in the hay field in the mornings when Mike has taken Toby for his morning walk. As we've found a couple of skulls of small carnivores - possibly foxes - in the field, Mike decided that the wisest thing to do was to put Toby back on the lead and take him home. 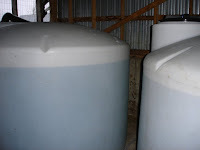 We still have a water shortage in the house, so Mike ordered two huge tanks (they hold around 6,000 litres (1550 US gallons) each) with the aim of filling them from the roof of the big barn. The tanks arrived when I was in the UK, so Mike had to roll them up to the barn by himself. He says he looked and felt like a dung beetle. 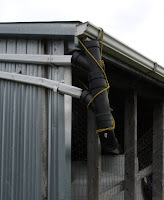 The barn already has guttering on the south side of the roof which is about 4000 square feet (370 square metres), but some of the guttering was blocked and they all emptied onto a patch of concrete, which wasn't much use. So on Tuesday Mike unblocked the gutters and attached the ends to one of the big tanks . It's a bit jury-rigged at the moment, while we make sure it works. Our new wood-burning stove was installed today in the living room, where before we'd just had a fireplace with glass doors. It looks great and we're both keen to test it out, although the temperature doesn't really warrant lighting a fire yet. I wonder who will crack first. The pumpkin soup was OK, and the pumpkin pie was fine, but I wouldn't go out of my way to make either again. Pumpkins look very jolly as decorations, and are obviously essential in that role for Hallowe'en, but I can't help feeling that the early settlers ate them because they had little choice. I don't often make puddings, so next year I think I'd rather have a lemon tart or something else that I'd really enjoy for Thanksgiving, rather than keeping to tradition with the pumpkin option. Landed back in Toronto on Sunday afternoon and have been frantically catching up with everything since then. The bat man had been back while I was away and installed a one-way door in the roof so that the squirrels won't be able to get back in. Haven't heard any scampering in the roof space since. Another man had been round to quote for replacing our roof and guttering (eavestroughs), leaving me with the tricky task of deciding which colour we would have for the roof. Hm, Weathered Wood, Colonial Slate, Driftwood or Georgetown Gray? Last night I accompanied Mike and Toby to the Puppy Kindergarten class. It was a bit boring, to be honest, but some of the dog training theory was mildly interesting. The tutor commented on how much the dogs had grown since last week and I agreed with her - Toby seemed huge when I got back on Sunday. When we got back I remembered to turn off the ring under the steamer so that we didn't have a re-run of the earlier Christmas Pudding fiasco. Today I'm back in Deseronto. It's really hard only being here one day a week - feels like I make little progress. Although, looking on the bright side, I did manage to create an accessions register and a donations form for the archives today. Technically it's only my fourth day of work here, so I suppose I'm not doing too badly. The display of school-related materials at the weekend went down well and I scanned in some of the photos for a caller today who'd found pictures of herself and her siblings when she visited on Saturday. I met one of the library cleaners just now who told me that she'd enjoyed the exhibit too. I'm now killing time a bit (I've got time to blog, for goodness sake) while I wait for the Archives Board meeting to start at 7.00pm. Last time we met in the Town Hall, but today we're meeting in the home of two of the Board members, which was once the Anglican church of St. Mark in the town, so that'll be interesting. It's going to be another very long day, though. This coming weekend is the Thanksgiving holiday in Canada - they're much more sensible (as always) than the Americans, having it in October rather than late November (far too close to Christmas) and making it a long weekend instead of having the main event on a Thursday. Whichever American decided that a Thursday was a great idea for the holiday definitely wasn't responsible for cooking the meal. So I've been looking up Thanksgiving recipes. 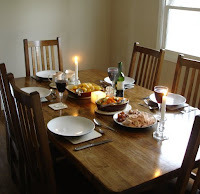 I think, as we've got Mike's mum here, I'll just make the meal an early Christmas dinner, but with pumpkins involved, either as a soup or as pumpkin pie, haven't quite decided yet. I somehow don't think Mum would go for Marshmallow Sweet Potato Bake. Though I suppose it might get the kids to eat sweet potatoes, which they normally scorn.